We rise to END any and all forms of racial oppression. So that all can breathe full and limitlessly and know they are free and divine. YES! We rise so that the legacy of slavery and oppression will not live on anymore. Not in the prison industrial complex or racial profiling or state-sponsored violence or senseless killings or ignorant stereotypes or hateful confusion or soul depression or greedy indifference. This stops NOW. We rise to heal the dis-ease of racism in all our hearts and the collective heart of the United States of America! We rise with galvanizing fire so that all the pain and sacrifices of our ancestors can be fully vindicated and freedom fully arrives! YES! We rise so that all can know a free heart when walking in the streets. We rise so all can lay in the shade of the Tree of Life, feeling luscious breezes and warm kisses knowing all are loved to their core. YES! We rise in affirmation that Black Lives are sacred. And sweet, ingenious, inventive, unfolding, blossoming, courageous, resilient, ancient, soulful, queer, folk, complex, diverse, precious and infinite. Celebrates All Life twined together as a Tree of Life. Examines the longstanding mechanism of racial oppression and white privilege in the United States of America. We rise with galvanizing fire to heal the dis-ease of racism in all our hearts and the collective heart of the United States of America! Affirming a daybreak that’s wondrously clear with the action of health and freedom for all, we envision: the police force as teams of Grandmas, of social systems based on Cooperative Abundance, of Children living free and being taught the Whole Truth of ancestry, of Love raining down and cleansing all. Recognizes that our human rising is grounded in the continual generative energy of our living earth. 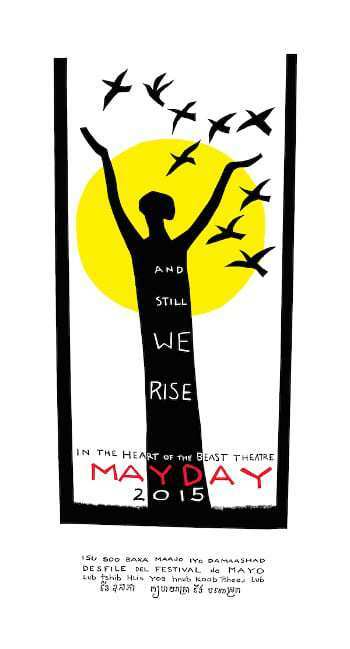 The title of this year's MayDay theme is inspired by Maya Angelou's poem Still I Rise. Thank you Maya Angelou (1928-2014)! Your many years of stunning, passionate work feeds us! 2006: The Time is Now! 2005: Where Do We Go From Here?